Today is the Colon Cancer Alliance’s Dress in Blue Day to help spread awareness of colon and rectal cancer. It’s a reminder of how screening and early detection can help thousands of people prevent and survive this common cancer. It is important to get screening if you have a family history of colon and rectal cancer and if you’re over 50. When found early, colorectal cancer can be curable, even preventable if polyps are found before they’ve turned into cancer. 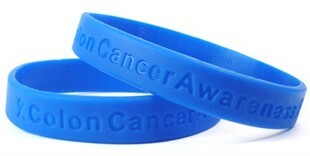 Show your support, buy the “Colon Cancer Awareness” Blue Rubber Bracelet Wristband in Adult 8″ (universal fit) size. Our Colon Cancer Awareness Wristband is made from durable seamless 100% silicone rubber, and packaged in an individual polybag. Buy the “Colon Cancer Awareness” Blue Ribbon Car Magnet. Our Colon Cancer Ribbon Magnet is manufactured and printed in the USA. We print on premium quality, super-thick (.030) magnetic material with UV protected inks. Be sure to remove, clean and reposition your magnet weekly.